As you probably know, High Definition video is not just a little better than Standard Definition, it’s a LOT better. Since a frame of HD video is so much larger than a frame of SD video, it requires a lot more processing muscle and storage. Producing HD is a lot more expensive than producing standard definition video. That’s where a brilliant solution called HDV comes into play. The term HDV is a combination of “HD” and the very popular “DV” format we’ve all been using for about ten years now. HDV is a very clever way of getting HD on DV tape. It’s done by using MPEG2 compression which is the same compression used for DVDs. MPEG2 is a much more complex codec than DV and this adds to the computer requirements. HD has about 5 times the number of pixels as Standard Definition or SD video. The pictures are stunning, but the very large files require lots of computing power to edit and store. If one second of Standard Definition video required 15 floppy disks, then one second of HD video would require 75 floppy disks! Compression is the only realistic answer to this problem. The DV format already compresses standard video by a factor of five to one. HD requires 5 times as much storage as SD. And the editing of HDV footage requires more computer processing power than most computers need for editing SD DV footage. 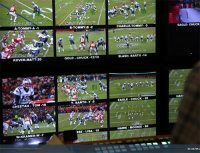 As we see widespread adoption of HD broadcasting and HDTVs, many expect that the HDV standard will become the norm for a lot of video production. However, DV and its’related formats is currently the mainstream as far as price and the popularity of cameras, decks and editing systems are concerned. Nevertheless, there will soon be more models of HDV camcorders on the market, and when the prices come down, HDV will likely replace DV as the main standard. But don’t run out and mortgage your house to get an HDV solution. Make a smart business decision for your video business niche. This transition to HD has different business implications for different businesses. For instance independent film producers will undoubtedly see business advantages for adopting HDV long before most wedding videographers. And TV producers will have a different timetable than corporate video producers. Surprisingly, the Discovery Channel which has a major committment to producing Hi Def, accepts all professional HD formats, but as stated in an article at tvtechnology.com “One HD format that was unacceptable for HD production for Discovery was the new semi-pro 19 Mbps system used by the JVC JY-HD10U,” which is HDV.” The HD formats that are acceptable to Discovery include D-5, HDCAM, HDCAM SR and DVCPRO HD. As with any business decision, study your area of the video industry carefully before making any assumptions. Thank so much for sharing your thoughts, this will go a long way to help in our decisions.